I love gadgets and gizmos, but as an environmentalist, I'm constantly aware of the need to avoid buying new things just for the novelty, or just because advertising tells me that I need it. When I do find something I like, I want to make sure that it's made of sustainable materials, and that it doesn't have a negative impact on the environment. This list, however, is packed full of some of the most amazing designs and sustainable ideas that I've come across in a while! Do you live or work in a windowless space, but really want to have some leafy, green friends to keep you company and help to purify your air? 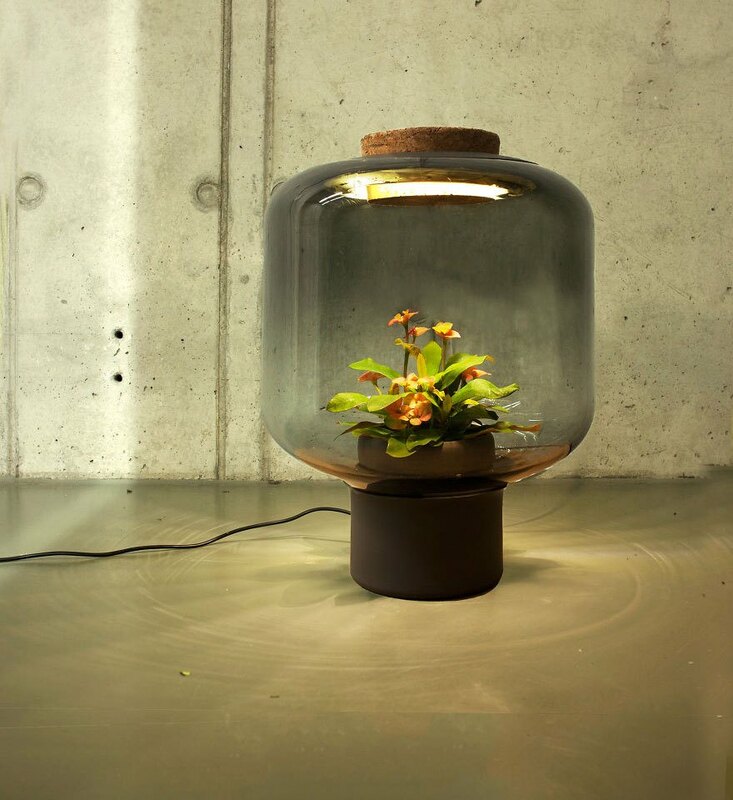 These amazing lamps by Nui Design Studio are the solution for you! Ok, can I please have all of these? Susan McLeary is florist and jewellery designer based in Michigan who combines her passions in these amazing living accessories. Her Etsy store PassionflowerMade features everything from rings to necklaces, bracelets to statement pieces. 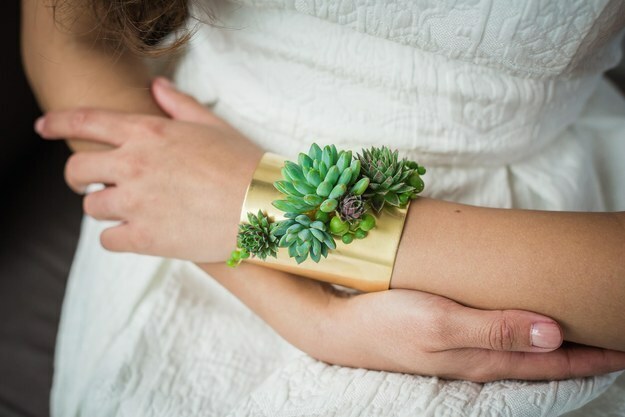 They can be worn for up to 6 weeks before the succulents grow roots and need planting. 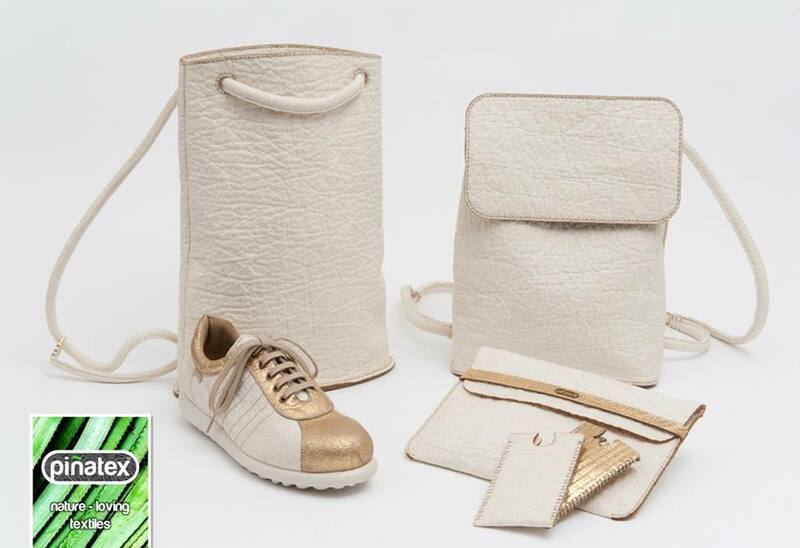 Ananas Anam is a Phillipines-based company turning pineapple leaf fibres into an environmentally friendly leather alternative (woo hoo!). The textile, Piñatex, also provides new additional income for farmers, boosting the economies of developing communities and empowering individuals. Conserving what little water we have access to is one of the most important ways you can combat our climate change issues. In an increasingly drier world, all water consumption needs to be mindful and focused on ways to reduce our water footprint. This awesome shower curtain will stop you from ever overstaying your welcome again: The tap has a sensor and after 4 minutes of running water, the sensor triggers the inflation of the spikes via an air inflator. LifeStraw uses a hollow fibre membrane that doesn't require chemicals such as chlorine or iodine. Using high pressure upon sucking through the straw, the water is forced through the narrow fibres, trapping bacteria, protozoa and other contaminants, which are then flushed out by backwashing. It removes 99.9999% waterborne bacteria (including E.coli), 99.9% of protozoan parasites, and other health issues such as Hepatitis E, Typhoid Fever and Dysentery. Turbidity (muddiness) is also reduced down to 0.2 microns3. Woah! What a game-changer for those living in poverty, or people traveling in areas where the water supply is polluted. 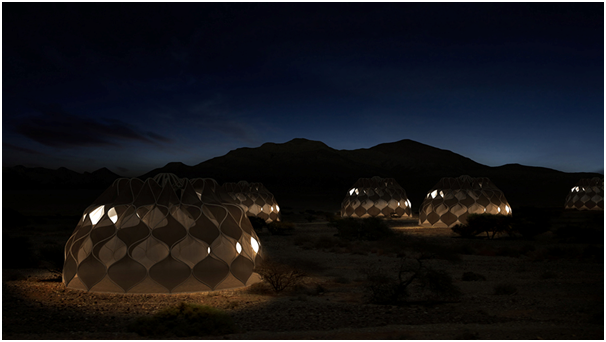 This is the invention of Jordanian-Canadian architect, designer and artist Abeer Seikaly. 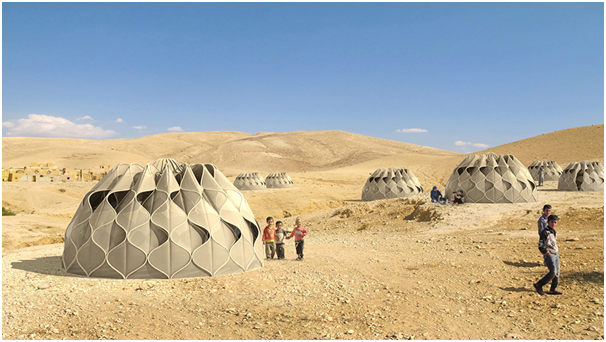 These amazing multipurpose tents were designed with refugees in mind, people who have been displaced by global and civil war, climate change and more. Inspired by elements of nature such as snake skin and traditional cultural aspects such as weaving, nomadic life and tent dwellings, this weather proof, strong but lightweight and mobile fabric tent gives refugees shelter but also a chance to "weave their lives back together". 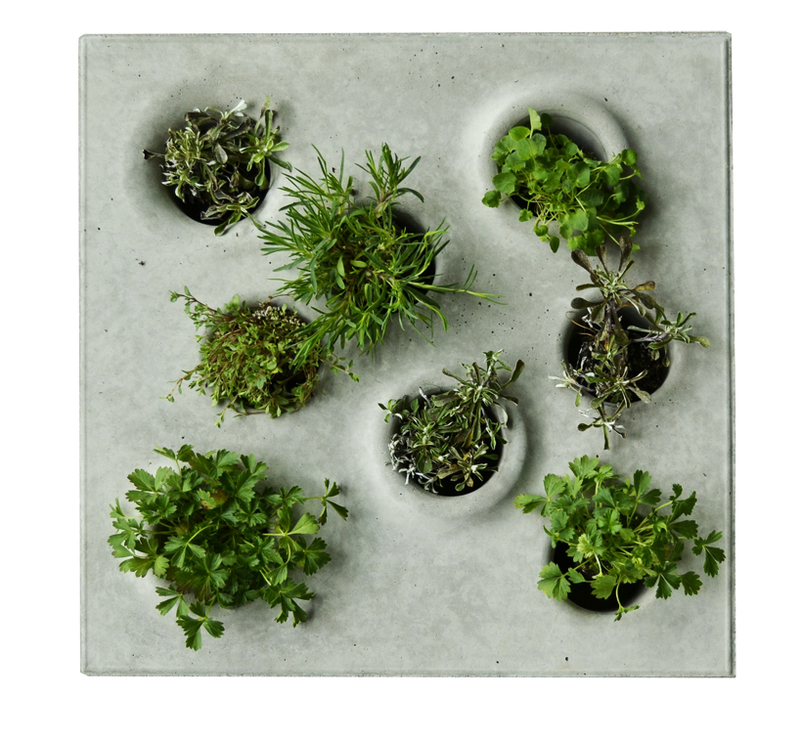 Swedish designer and thinker Caroline Brahme has come up with some seriously snazzy tiles and pavers that can house tiny pockets of greenery, significantly brightening up an urban space. The benefits of plants aren't just for the planet, either. Did you know that pot plants indoor can help clean your air, reduce pollution and even improve your mood? Imagine how much joy watching these little plans grow out of your walls or paths could bring. 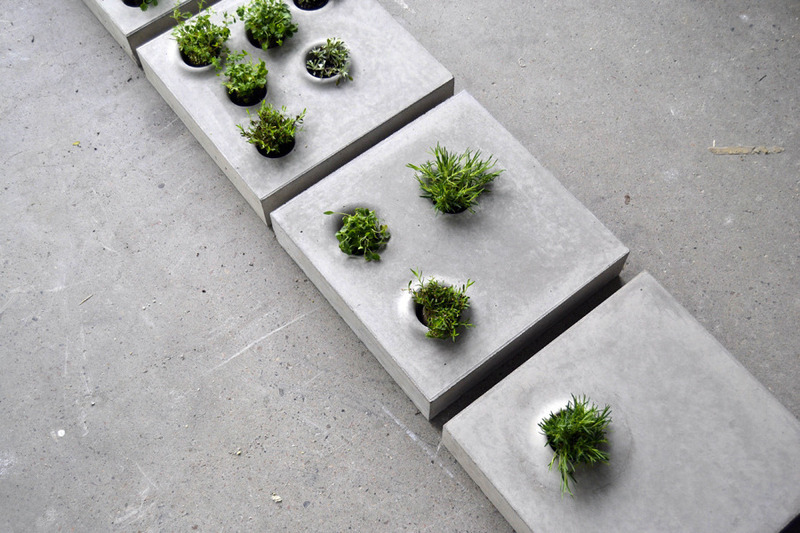 The new design is an awesome innovation for anyone that wishes they could beautify a concrete expanse (such as a wall, a garden path or a gloomy bathroom). These amazing houses are "bulletproof, fireproof, and can withstand earthquakes. They also maintain a comfortable temperature, produce zero carbon emissions, and are powered by solar and methane gas from recycled waste". By filling the bottles with sand, then binding them together with mud and cement, strong, solid walls are formed. 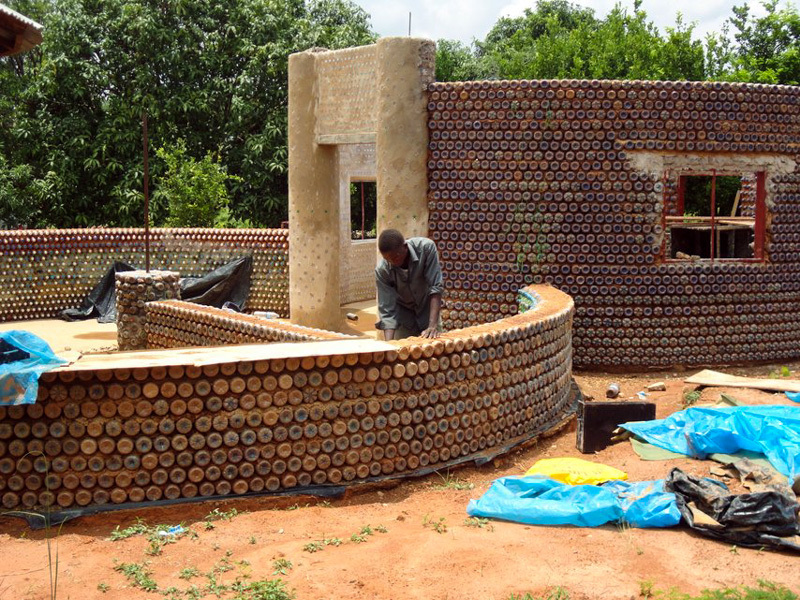 They can be used to make homes up to three stories, using over 14,000 bottles! 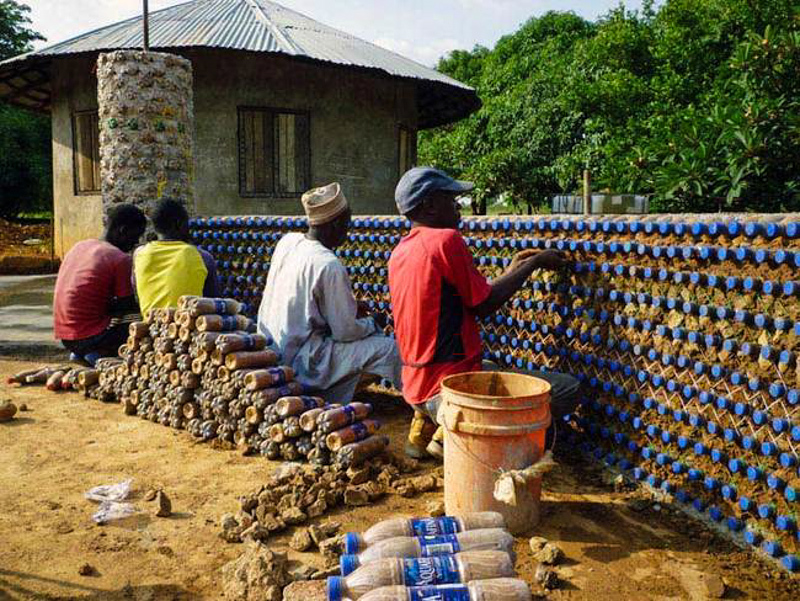 With over three million such bottles thrown away every day in Nigeria (and 130 million per day in the U.S.), there is an abundance of building material available for these thrifty builders. 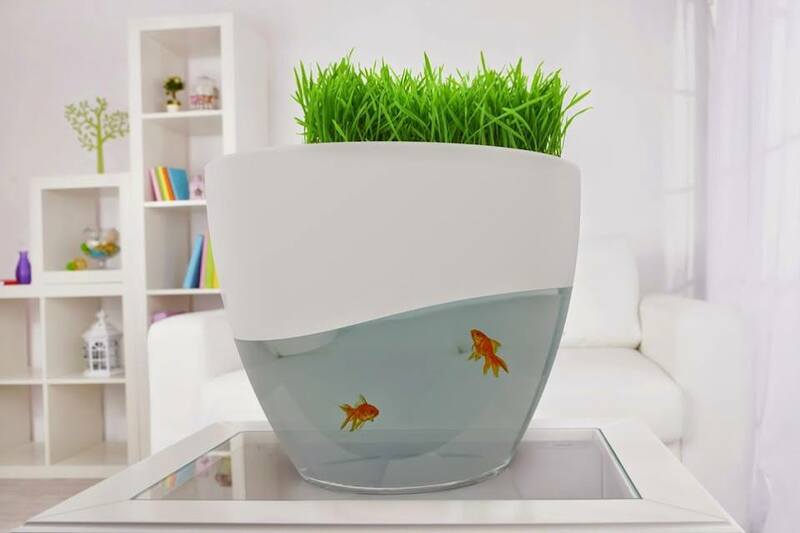 Vegua is a miniaturised aquaponic garden that looks like a cross between a fish bowl and a pot plant. "Fish live in the transparent tank at the bottom. Their waste produces bacteria, which is absorbed along with water into the rock mixture above the tank. Plants in the rock and sand eat the bacteria, in a process that keeps the water below clean. 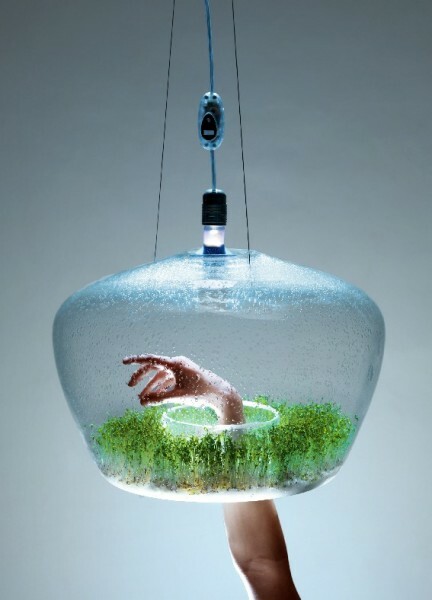 Kristýna Pojerová is the amazing woman behind the Glasshouse Lamp, a hanging light that "aims to satisfy the desire for fresh herbs in a city kitchen". 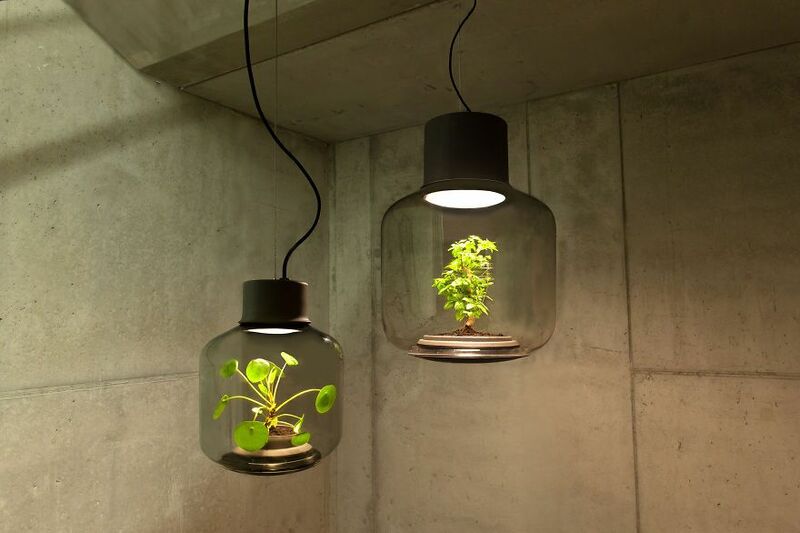 Herbs can be planted inside the lamp along its outside wall in the "gutter" around a central opening. 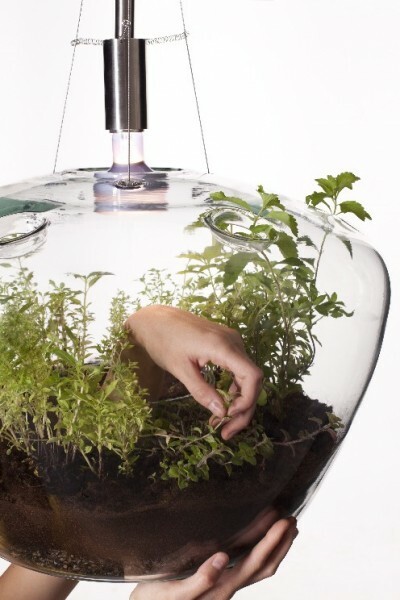 "This opening not only facilitates access to the herbs and the passage of light from a bulb hanging up in the lamp but it also ensures adequate ventilation enhancing natural microclimate", says Kristýna on the project website. 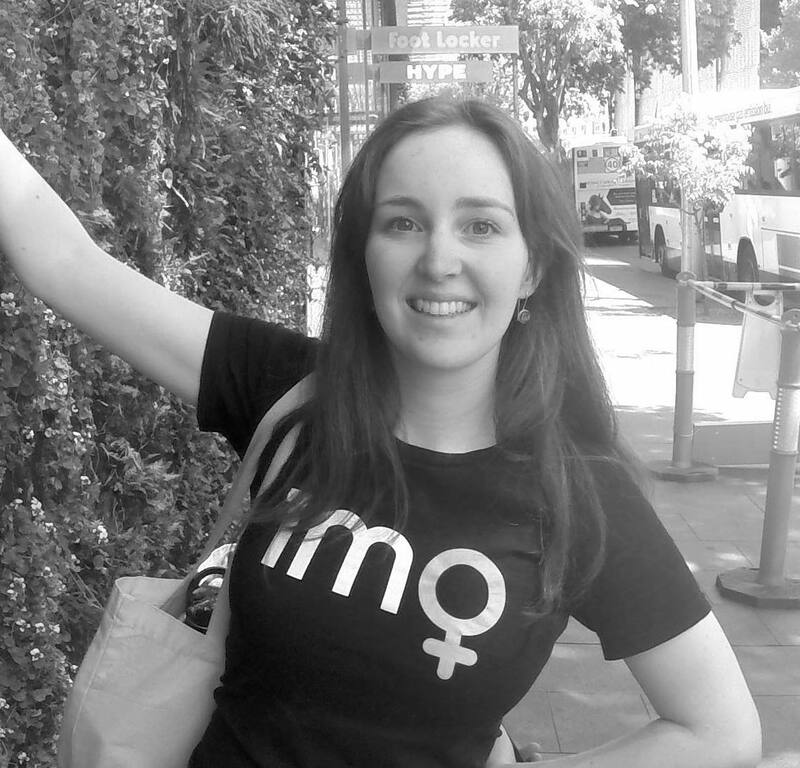 "It is basically about making use of the otherwise useless waste heat of the bulb." Do you know about an awesome sustainable invention that's not on this list? Email us or comment below to let us know!